Hello all. I am in the process of building my first AR platform rifle or pistol, not sure which i want to tackle first, in 300 AAC Blackout. Looking for any recommendations on manufactures, parts, so on and so on. what to get the best bang for my buck so to speak. thanks for your help. If it's your FIRST AR assembly I would recommend starting with a standard 556. The availability and logistics involved with assembling, learning and actually shooting the system will be better suited in a cartridge already abundant everywhere. Now - if you're building just a 'Garage Gun' then any non-standard caliber choice will be more suited. There are dozens of AR SME's on the roster here, so I'll step back and let them pronounce their favorite and/or preferred choices in the matter. However - I strongly recommend you at the very least get yourself set-up and started with a standard AR/M4 Platform and understand the basics of the original design prior to moving forward into other areas. thanks for the info. The reason for the 300 blackout choice is that in my state 5.56 / 2.23 is not legal for deer hunting. 300 blackout is. i want this weapon to have a multi purpose of home defense/hunting. i am very familiar with the M4 platform. So the configuration of the weapon is a non issue. Thank you again for your help and input though. AR's are like legos dude. No real gunsmithing required on your part to assemble whatever you want. They are like race cars, the more you spend the faster they go. Biggest thing is to figure out what purpose you want the weapon to serve. Long range? Hunting? Home Defense? 3-Gun Competition? Once you figure that part out then it's just a matter of buying the parts you need to fill that role and sticking them together. Come back with that info and you will get some better advice. Just saying "I want to build an AR" isn't going to get you very far. It's like saying "I want to buy a vehicle." Fair point. What i am looking to build is a multi purpose weapon that can be used for hunting as well as home defense. Okay....Home Defense / Hunting is possible. I would suggest building for home defense and take it hunting versus the opposite. So, what attributes make up a home defense AR? The 300 BLK is a great in-between option for home defense and hunting, depending on what you are hunting (hogs, coyotes, etc). I probably wouldn't make it a deer gun. However, you should decide now whether or not you plan on putting a suppressor on it. The 300 BLK can be very finicky when trying to tune suppressed vs. non-suppressed, as there are bullet-weight/gas/cycling issues to take into account. Additionally, if you plan on going the SBR route, you'll end up with a two stamp gun (SBR & suppressor), which is an additional $400 alone. Having a pistol 300 BLK kinda precludes it from being a hunting gun, and puts it more into the defensive realm. That is a good way to put it. I want a home defense weapon that can be used for hunting. the AR platforms that i am familiar with are the M4, M16 (Family), and the AR 10. In length i would want anything longer the the M4 and i want nothing shorter the 8.5" barrel. Reliability is a must if used for self/home defense. I am a minimalist on accessories magpul angled forward grip at most maybe a light. as far as sights flip up for back up and a CCO of some sort. AR pistol is defiantly an option for hunting. My brother is running a 7" 300 blackout pistol and took 2 this year and one last year. As far as 300 blackout being used on deer well we haven't had an issues yet and i would guess it i a matter of opinion. Like most things lol. There are dozens of AR SME's on the roster here, so I'll step back and let them pronounce their favorite and/or preferred choices in the matter. Building a 300 BLK pistol as a hunting tool just doesn't make sense. The primary purpose of SBRs and pistols (in rifle calibers) is for compact defensive purposes. If you already have experience with the M4/AR-15 platform, and want to hunt, then build an AR-10 styled rifle (same .308 cal as the 300 BLK with more punch). If you want to build a defensive short barreled anything gun, then by all means, go with a 10.5" bbl 300. But, I would not try to make one that does both. Deer he took two deer. And I am looking for opinions on parts and manufacturers. I wasn't trying to be disrespectful. In my opinion a AR Pistol can be a excellent hunting tool i all i was getting at. and as for two builds i would love to do that but at this present time i only have the funds for one. I am just trying to see if i can kill two birds with one stone. I would also like a AR 10 at some point. I took my brothers out this year and took a small 6 point at 145 yards. You ask for opinions dude, you're gonna get em. You also need to tighten up on the spelling and grammar. That's what JAFO is hinting at in red above. I understand that. I didn't say that I did not want them or that I do not appreciate them. I simply disagree with one. As far a spelling and grammar, that i can work on. I don't get it. You come onto this board, ask for recommendations (not opinions) from SMEs, and then wish to "disagree with one". I would recommend you throttle back to idle, say thanks for the "recommendations and opinions" and wait for other members and SMEs to respond (i.e. read more-post less). Otherwise, it looks like you're trying to quiz members rather than ask a question and wait for several educated answers. You also have "Semper Paratus" under your posts. So, were you prior USCG, part of the Semper Paratus gun plumbing alumni, or just stating that you are "Always Ready"? Because, your profile states Army 11B & NG. You are right I did ask for opinions and I thank you for yours as well as your recommendations. I do not want it to look like I am quizzing anyone. Semper Paratus Motto of 1-12 Cav. I was in in B Co. 1-12 Cav, 3 BCT, 1st Cav Div. in Baqubah, Iraq in 2007. Again I did not mean to ruffle feathers. 300 Blackout was optimized for use with short barrels in the 8"-10" range. Anything longer than that gains nothing in velocity. Unfortunately we have NFA laws which make that a little more difficult. I also wouldn't be trying to configure the HD/SD/SHTF rifle as the same thing for hunting. I don't hunt so I can't offer anything there. But if I was a hunter I would be looking at rifles/calibers that are established already. I recently built my own AR-15 with a SPECIFIC intention, I wanted the lightest completed rifle I could build without giving up reliability, accuracy, and upgrade-ability. I think I succeeded. Please keep in mind, I did a thorough search of these forums, and went from there. Silently. If I had a question I would send PM's, and WAIT.....PATIENTLY.....for a response. Just some advice from a "regular" member since 2004. 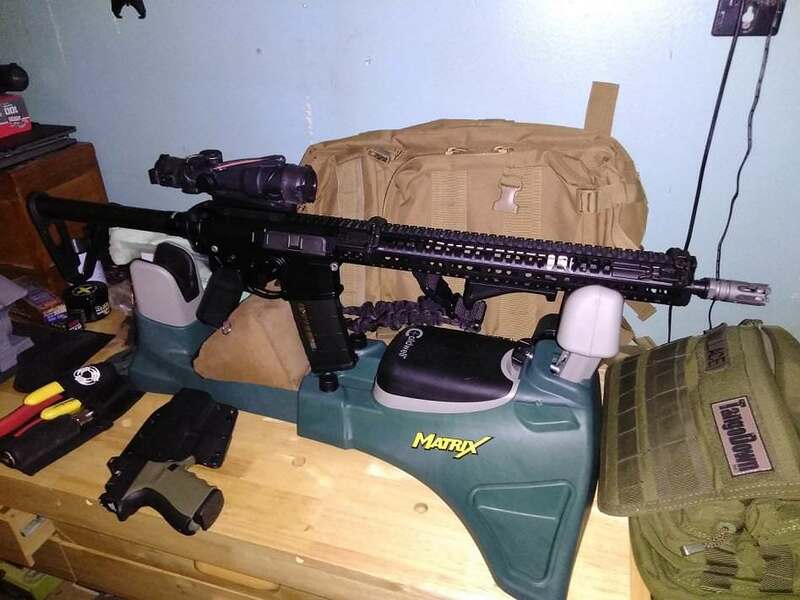 I started with a 2A Armament BLR-16, added a Smoke Composites Short Pull carbon fiber stock, JP Industries captured buffer spring, Lantac ETC-1 single stage trigger, Magpul grip and Mlok Angled foregrip, Magpul Pro angled BUIS, and Trijicon TA31F ACOG with the ARD/Caps. 7.5 lbs with optics and loaded mag/sling. So as seen, kitted for carry, 7.5 lbs. Took around 600 rounds to smooth everything out, runs like a singer sewing machine now, eats everything fed to her. Extremely happy with this rifle. I just built a 300BLK HD SBR. I used a PSA lower, Giessele SSA trigger group, standard ar15 buffer tube n spring. I then used a PSA 300BLK 8.5 inch assembled upper with 416r barrel. BCG is PSA with BCM extractor kit. Nothing fancy. I put a can on it and it runs great, no issues after I had to re-tighten Gas Block set screws with loctite. My first AR build. Learned allot. If you are looking for a short barrel that you always run suppressed, go with .300 BLK. If you do not intend to have a short barrel that is always suppressed, get a 6.8 SPC II or a 6.5 Grendel. The 6.8 SPC II is an excellent hunting round. The .300 BLK is not an excellent hunting round.